This breathtaking cuff bracelet from Buana in Bali calls to mind the lush and florid temple gardens of Indonesia. 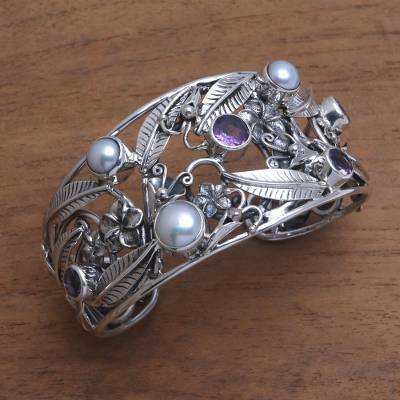 The sterling silver cuff is set with 4 carats of sparkling amethyst as well as iridescent white cultured pearls. Jewelry that is bound to impress even the pickiest shopper! I have received many, many compliments when I have worn this bracelet. When I received it and opened the box, I thought it was more beautiful and substantial in weight than I could tell from the pictures. The pearls and amethyst make it appropriate for a dressy look or very informal with jeans. The workmanship and the design are impressive. "Temple garden floral cuff bracelet"
Beautiful cuff. Will enjoy wearing and sharing the story of it's origin. I received it as a gift. I simply love it. The workmanship is excellent and I have had people ask me where I got it. My husband shops for me on the Novica website all the time. This is my third piece of jewelry and I am very happy with all of them. I have posted pictures to FaceBook and reference Novica to try to get you more business. I am a delighted customer. "Feminine cuff with pearls and amethyst"
Just received this bracelet and am thrilled with its beautiful design and workmanship! I have a small wrist and it fit me perfectly. Highly recommend! I purchased two of these bracelets for Christmas gifts. They were just delivered and they are beautiful. The items look much more expensive than they are. Beautiful and well made. I don't have to worry about the stones or pearls falling out, it is very well crafted. I have small wrists and this works perfectly. It is very beautiful and I get many compliments on this piece. "this is a present to myself"
This item was spectacular!! Its beauty exceeded my expectations! It is the first of many items to be ordered! Words can not describe how absolutely beautiful this cuff bracelet is...the craftsmanship is phenomenal! I've bought many beautiful pieces of jewelry from Buana, but I have to say this piece is exquisite. I bought 4 of these to be given to our daughters and God Daughter. My husband and I just recently decided we want to give keepsakes/heirlooms to our loved ones so they'll have something to remember us by. This purchase was the first of many to come. Thank you Buana for never failing to deliver such quality pieces of jewelry.